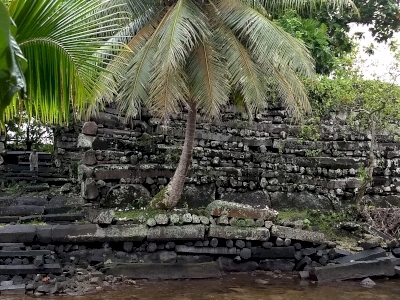 'Nan Madol: Ceremonial Center of Eastern Micronesia' covers megalithic monuments on nearly 100 artificial islets on a coral reef offshore of Pohnpei Island, in the Pacific. The islands were linked by a network of canals. It was the religious and administrative center of the Saudeleur Dynasty (ca. 1200-1600 AD). The complex consisted of royal and commoners residences, tombs and temples. There was no fresh water or food onsite. Its population probably was 1,000 at most. 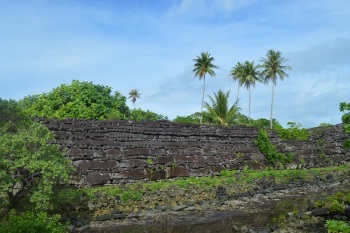 By the time the first Europeans arrived, in the early 19th century, Nan Madol had already been abandoned for centuries. Nan Madol, on the island of Pohnpei, came as a wonderful surprise to me as part of my trip flying on United's Island Hopper flight between Honolulu and Guam. 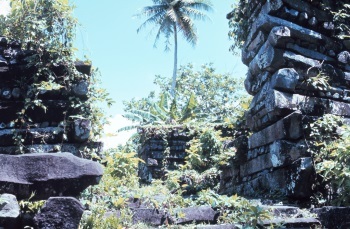 It was a small city, constructed of stone on artificial islets along the coast of Pohnpei. Construction is dated to the late 1100s and it served as the capital of the Saudeleur Dynasty of the islands until 1628. The scale of it all is truly amazing. Great stone buildings separated by a series of ocean canals, protected by a large breakwater wall. The most impressive remnant is the tomb complex in the center, where the building's (palace's?) remaining walls are over 20 feet tall in spots. And what incredible walls these are! It is constructed of a mix of massive basalt boulders and huge hexagonal basalt crystals. You might be familiar with these hexagonal crystals from the Giant's Causeway in Northern Ireland. Here, long pieces of them are stacked to form walls, reminding me of a set of heavyweight Lincoln Logs, stacked in bunches to form these formidable walls. But the mystery of how this small island civilization constructed all this gets even better, because this type of basalt rock and crystal form is only found on the opposite side of the island! Some of these stones weigh many tons each. The local legends say that the stones were magically flown through the air from the other side of the island to build this city. However they managed to accomplish it, I am very impressed. It was really exciting to encounter such an archaeological mystery that I had never heard of before this trip. After visiting Nan Madol, we also stopped at the Pohnpaip Petroglyphs which are one the way back to town. These were pretty nice to visit and you get to walk right out among them (they are carved into a house-sized rock outcropping). Sadly, it didn't seem like anyone really know anything about their historical context or meaning at all. A fun side note: the taxi driver who drove us to a restaurant one night told us that his father's family was the one who owned this part of the island and so he lived near there growing up. He told us some of the stories he'd been told as a boy, including repeating the "stones flying through the air" part, and that no one ever goes into the complex at night now, that that is completely forbidden. I visited Nan Madol in 2007 and ever since I had thought it was not only worthy of world heritage status but probably the most deserving site I had been to which wasn't listed. Getting to Micronesia isn't easy, and getting to Nan Madol takes a bit of effort once you are on Pohnpei, but it is well worth the effort. Expect to be alone when you visit or be among a very small number of tourists. It has been called the "Venice of the Pacific" for good reason. The small islands and structures separated by canals evokes images of Venice. I think that Nan Madol is the top attraction in the Pacific, perhaps even surpassing Easter Island. 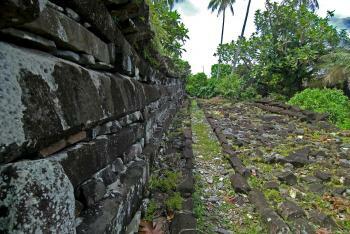 Read more about Nan Madol: Ceremonial Centre of Eastern Micronesia on my website. In December 2015, I spent a couple of days in Pohnpei at the Mangrove Bay Hotel, a short walk from downtown Kolonia, the capital of Pohnpei. Kolonia is not a very interesting place, but I did manage to find a couple of historic sites like the Spanish wall, built in 1899 as a boundary for Fort Alphonso XII. The wall is one of the few remaining remnants of Spanish control and now serves as the outfield wall for the baseball field. I also wandered around and found the Catholic bell tower and adjoining masonry apse, all that remain of a church built in 1909 by German Capuchin missionaries, when Pohnpei and the other Caroline Islands were administered as part of German New Guinea. I organized a trip to Nan Madol with Pohnpei Surf Club, which is located on the ground floor of the Mangrove Bay Hotel (www.pohnpeisurfclub.com). I paid US$125, which accounts for solo travel on Christmas (it should be less expensive with a group). There is a tide chart stapled to the Pohnpei Surf Club's door, so you could time your visit to Nan Madol for low tide, as I did, when I was able to wade across the channel that separates the complex from the main island (at high tide, a visitor would need to swim or arrange for a kayak, which I heard is difficult to arrange). From the Mangrove Bay Hotel, it was a 45-minute or so drive to the beginning of the footpath to Nan Madol. There is a fee of US$3 to walk to Nan Madol. The path, through the mangroves, was well maintained (many sections seem to be relatively new boardwalks), and I saw a lot of mudskippers and mangrove crabs and heard a lot of birds. After a 15-minute walk, we arrived at the narrow channel that separates Nan Madol from the mainland -- since it was low tide, with the water less than 1 ft deep, my guide and I were able to wade across to Nan Madol. I spent an hour or so wandering around Nan Madol, where there were no other visitors, and after clambering over fallen pieces of the original structures, ended my visit at a point where Nan Madol meets a few larger channels. Upon departure, my driver stopped by the local chief's home and paid another US$3 fee. On the way back from Nan Madol, we stopped at Kepirohi Waterfall, where I was able to swim in the pool beneath the falls and cool off. From what I've read, this is a standard stop on the way back from Nan Madol. Erich von Däniken: See Erich Von Daniken (1973), The Gold of the Gods, Chapter 4: "Temuen, The Island They Call Nan Madol"
10 Community Members have visited.